Though having grown in an extremely religious family, Alena has managed to break away and make a life of her own. While not part of the religious group anymore, Alena still tries to live by some of its tenets. Though she still misses her brother desperately, with her husband by her side and a successful business, things are looking pretty good. Unfortunately, Alena should have listened to her mother's warning about being more humble. When Alena catches a disease associated with the supernatural that kills rapidly, she has to make choice between keeping her soul or becoming evil like the supernaturals she was raised to hate. Venom and Vanilla is only 240 pages long and it's quite the wild ride. At no point did the story feel rushed though it was filled with action. If anything, the times it did slow down were the times it felt disconnected. I really didn't need Alena's recitation of her baking recipes or the interlude making baklava. It's set in a world in which the supernatural in North America are being forced to live beyond the 49 parallel behind walls. As a Canadian, this had me rolling my eyes just a bit. I had to admit that given that so much of Mayer's story is set in what would have been Canada, that I was a little bit disappointed not to get a sense of my home. That being said, I suppose she gave Canada the interesting side of the border. I started out really feeling for Alena. Alena is hospitalized and dying, only to be told by her husband just how quickly he plans on moving on with his new girlfriend and what he plans to do with her money. Her husband doesn't even plan to wait until she's dead. Even Alena's struggle to decide whether or not she should allow herself to die or become supernatural really touched me. At this point she felt real to me. If only Mayer had kept this tone throughout the book. By the time the action starts, Alena's refusal to swear, her ridiculous sayings, as well as her constant second guessing of herself based on her religious upbringing got on my last nerves. Her constant insistence that she is still married though the government has declared her dead irked me. It's rare to have a protagonist move from warm and easy to relate to, to downright irritating. It's a vicious pendulum swing. 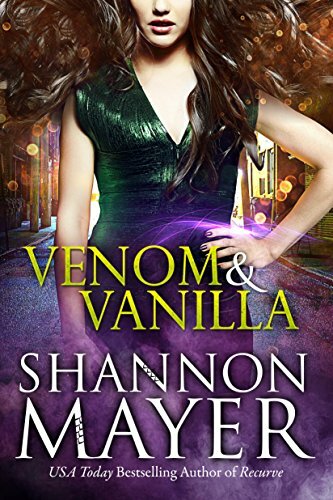 Fortunately, the world in Venom and Vanilla makes up for Alena's shortcomings. Mayer's world includes, all manner of supernatural creatures as well as the Greek Pantheon. Yes, the mythology geek in me had a pretty big squee when all of a sudden I found myself reading about Zeus's marital problems with Hera. I very much appreciate Mayer painting Zeus as the douchebag that he is because in recent incarnations, the modern interpretation of Zeus has been far kinder than he deserves. I love the idea that heroes and monsters are intrinsically linked and the idea that maybe monsters aren't who we believe them to be. I will however say that though the ending of Alena's battle with Achilles was extremely predictable, I at least enjoyed the battle. I know that I've said that Alena is irritating and my opinion on that hasn't changed but I do think it's worth noting that she's a very strong character. Alena is chosen to be changed into a monster because Merlin thought she would be easy to control and become fodder for Achilles. Alena continually fights her instincts to just follow along with the religion that she was raised in and has no problem telling people were to go, even if the language employed is irritating. I do like that she set hard and fast boundaries regarding her physical body and didn't allow any man to touch her without her permission. I love that she fights back on being controlled and decides to fit into her new skin. My absolute favourite character in this book is Yaya (Alena's Grandmother). She is fearless, sharp and a take no nonsense type of woman. I love that she joined the cult religion to hide the fact that she is still a priestess of Zeus, then promptly sleeps through the occasional service she decids to attend. I love that Yaya is so loyal to her family and has lived a full and active life. Yaya also functions as a bit of comic relief in the story. Venom and Vanilla despite its very diverse supernatural characters didn't really have a ton of marginalized inclusion. Officer Jenen is the only character of colour and he amounts to a side character at best. I don't know anything about him beyond the fact that he works for the head vampire and his dream romantic partner is a woman that he can save. That's it folks. He's hardly a character. In terms of GLBT inclusion we have Dahlia, Tim and Gavin. We are introduced to Dahlia at the very beginning of the book. She is dying of the same illness as Alena but does not have enough money to transform into a supernatural. When Alena initially decides to stay human, Alena gives her transformation money to Dahlia, thus allowing Dahlia to become a vampire. Dahlia starts off as straight and apparently the shift to vampire makes her bisexual. Apparently, becoming a vampire "ramps up hormones." Given that there are no other GLBT characters in this story, this is indeed a problem. It presents bisexuality as something which doesn't happen to humans and is magically induced. I do however like the fact that Dahlia and Alena have a very strong bond and are clearly willing to go to the mat and back for each other. In terms of Tim and Gavin, they are even lesser characters than Officer Jensen. Venom and Vanilla is definitely a case of tastes will vary. The beginning of the book is gripping, draws you in and encourages you to empathise with Alena. Unfortunately, when Alena survives, you discover just how irritating she can be. If you continue reading at this point, it won't be for the protagonist but because you like the side characters and the world Mayer created. I suppose the best way to describe this book would be to call it a mixed bag.